Jesse, Tulip, and Cassidy are ushered into the limelight in the first round of character posters for Preacher season 2. 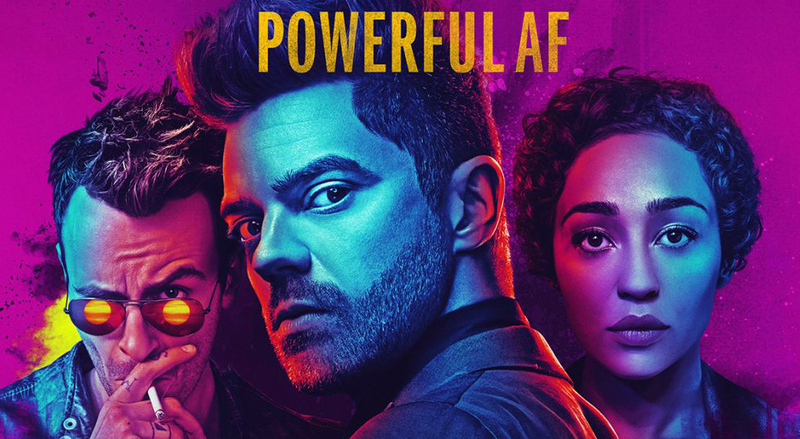 Brought to life by Dominic Cooper, Ruth Negga, and Joseph Gilgun, respectively, today also heralds the arrival of the really rather striking key art, which unites those three dubious anti-heroes under the rather fitting tagline, “Powerful AF.” With little over a month to go until AMC’s cult comic adaptation returns to the airwaves – June 25th is the date for your diaries – we imagine this media dump is serving as a welcome precursor of the inevitable first trailer. After all, we’ve already caught a glimpse of the riotous road trip that awaits Jesse and Co. (see below), so we wouldn’t be too surprised to if the full-length sizzle reel were to rear its head in the coming days. Watch this space for more. Rounding out the cast list for Preacher‘s second season is Graham McTavish as The Cowboy (AKA The Saint of Killers). In terms of the newcomers to the fray, AMC has so far recruited Noah Taylor, Pip Torrens, Julie Ann Emery (Fargo, Better Call Saul) Malcolm Barrett, Ronald Guttman, and Justin Prentice, who can currently be seen amongst the cast of Netflix phenom, 13 Reasons Why. Preacher is expected to conjure up another potent dose of supernatural thrills and spills when AMC’s cult drama returns for its second season on June 25th. It’ll run for 13 episodes in total, but the real question is whether the network’s jet-black comic adaptation can avoid the sophomore slump. We’ll find out one way or another when Dominic Cooper’s chain-smoking pastor swaggers onto the small screen late next month.